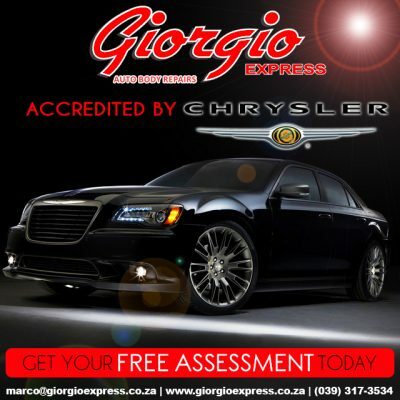 Did you know that we are accredited by Chrysler for passenger vehicle repairs? Through our constant top class workmanship and eye for detail, we have been accredited by Chrysler as an official approved collision repair center. When dealing with Giorgio Express Auto Body Repairs you have instant peace of mind knowing that you are dealing with the best in the business. If you find yourself part of a collision please contact us on our 24 hour line 072 612 5747 and we will be there to help. Approved service centre for: Audi, Chrysler, Jeep, Dodge, Fiat, Alfa Romeo, Citroen, Peugeot, Ford, GWM, Honda, Hyundai, Kia, Lexus, Mercedes Benz, Mitsubishi, Nissan, Toyota, Volkswagen, Smart and Mazda.